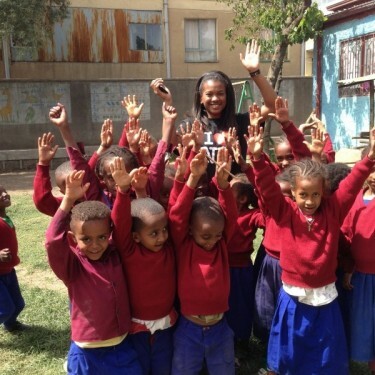 From our Volunteers, Interns and Visitors page, please take a look at Nubia Wilson’s experience at Fregenet Kidan Lehitsanat School. My name is Nubia Wilson; I am seventeen years old and currently a junior attending International Community School of Addis Ababa. I have recently moved to Ethiopia in the beginning of 2016. Although this move has been a huge change in my life, having the Fregenet Foundation here in Ethiopia has helped ease my transition. I have been volunteering at Fregenet annually since I was in 5th grade and wouldn’t change this opportunity for the world. As each year passed, I would watch all the children grow, both physically and mentally. When I first began to go to Fregenet, it was more of a chance to play around with kids my age and learn Amharic from them as they would learn English from me, rather than serving my “community service”. At that age, I was incapable of distinguishing who these kids were and what their backgrounds consisted of. All I was capable of knowing was what was instilled in their hearts. These kids’ hearts are full of pure love. It’s as if they know nothing but only how to love, and sometimes in life, that is all we need. From such a young age, these kids taught me the importance of love, joy, and true happiness. I’ve learned things at Fregenet that one cannot learn from a school textbook or a professor, and for that, I am extremely grateful. During my first visit to Fregenet, I came across a young boy, Nahom, who was in Kindergarten. He looked as if he hadn’t eaten a meal in days. My heart aches for each and every kid, but from the moment I laid my eyes on Nahom, he had a special place in my heart. He was in line to get a piece of bread from his teacher and he kept looking over at me, as I was standing alone. Just after he got his piece of bread, he ran over to me, and offered the whole piece to me. I was completely shocked by his generosity. As hungry as he might have been, he offered me everything he had at that very moment. Nahom’s love and kindness shows how people who have absolutely nothing could be the richest in their minds and souls, even at an age as young as Nahom. In return, I wanted to repay the kids of Fregenet for the life-long lessons they have taught me. As I turned sixteen in 2014, in lieu of celebrating a traditional sweet-sixteen birthday party, I decided to ask my family and friends for donations for the Fregenet Foundation. I realized that one party wouldn’t affect my life as much as the proceeds from it could possibly change the lives of the students at Fregenet. I created a CrowdRise page and PayPal account and received several generous donations from friends, family, and even random donors. From my “sweet sixteen” I was able to collect 100000 Ethiopian Birr and donated all the proceeds to Fregenet. I followed up with this tradition the following year for my birthday was able to raise about 50000 Birr. Conclusively, volunteering at Fregenet has been a life changing experience for me. I encourage everyone to visit or help in any way that they can. Now that I am living in Ethiopia, I have more of an opportunity to continue my work at Fregenet. I can’t wait to see what the future has in store!